With your eyes closed, you would never guess this is a green smoothie. I’m a huge fan of green smoothies and I make them more frequently than any other kind. 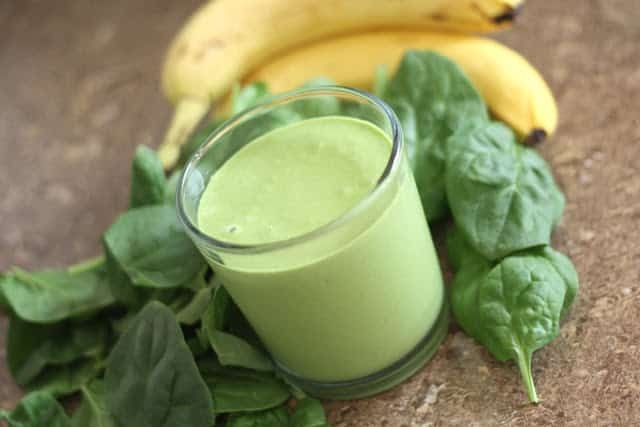 However, even I was surprised by the way the bananas and peanut butter disguised the spinach in this particular smoothie. 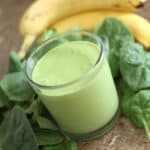 This smoothie was thick, creamy and absolutely delicious. Layer ingredients into the blender in the order listed. Puree until smooth. Enjoy! This will sound bad but that looks like the exact same color as Kermit the Frog. I agree with you, if I'm looking at that, my first thought is not "peanut butter" or "banana" because of the color. I love that color--but love that has all that nutrition from spinach in it. I adore peanut butter and banana smoothies. I think that adding some spinach would be a great idea. Thank you for sharing with me! Just made this, but I made only a single serving, used 1/2 cup soy milk, 1 cup spinach, 1 frozen banana, and 1 TBSP of all natural PB. Just the perfect size for me and since I used light soy milk, the total calorie count comes to roughly 230 calories! I'm wondering if this stays good in the fridge for a day? I'm thrilled that you liked the smoothie, Anna! I just made a double batch. Used unsweetened almond milk.....Delicious !!!! I'm so glad you like the smoothie, Susan! I'm so glad you enjoyed the smoothie, Maribel!